With only one more week to play in the regular season, the MVP race seems clear. 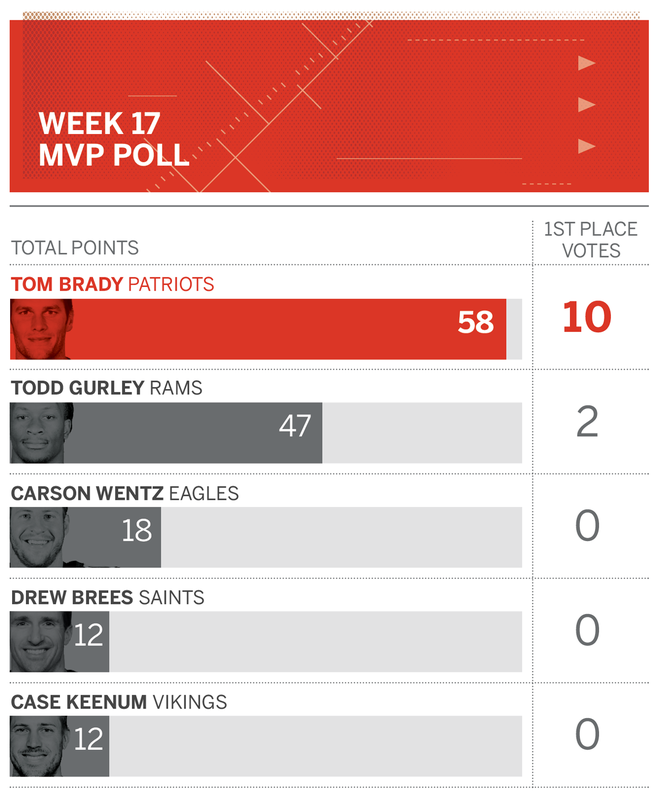 Sure, Todd Gurley made up some ground on Tom Brady in this week's poll. But with the Rams resting their star running back in Week 17, it's hard to imagine what could effect a change at the top. Down the list? Maybe if Russell Wilson delivers a superhuman performance to lift the Seahawks into the playoffs, he could crack the top five. Same for Philip Rivers if the Chargers get in. And who knows what a defensive lineman such as Aaron Donald or Calais Campbell has up his sleeve in a season finale that could vault him into our top five. For now, though, the name at the top is as obvious as it gets. The case for Brady: He's first in passing yards, second in yards per attempt, second in passer rating, third in touchdown passes, third in QBR and tied with Pittsburgh's Ben Roethlisberger for first in wins. Brady also kills it in some of the advanced metrics, such as Football Outsiders' DYAR stat, which measures total passing value. But as far as MVP candidates go, he's the quarterback for the team in the driver's seat for the No. 1 seed in the AFC, and he's playing lights out. That wins you MVP honors. The case against Brady: The only case you can really make against Brady is a case for someone else, combined with your own belief or conclusion that the other case is stronger. There's some nitpicking that could be done, including the fact that Brady has five interceptions and only four touchdown passes in his past four games. And the loss in Miami was an absolute clunker. But the nitpicking doesn't overcome the excellence. The case for Gurley: He leads the league with a stunning 2,093 total yards from scrimmage, including a league-leading 1,305 rushing yards and another 788 receiving yards (good for top 30 in the league overall) on 57 catches. He also leads in total touchdowns with 19 -- six more than Texans wideout DeAndre Hopkins. Gurley's 19 scrimmage touchdowns is a higher number than the passing touchdown total of all but 16 quarterbacks in the league. Oh, and the running back has been particularly incredible over the past three weeks while the Rams were playing potential playoff teams and sewing up their NFC West title. Gurley has 366 rushing yards (most in the league), 225 receiving yards (10th in the league) and eight total touchdowns over the past three weeks. The case against Gurley: Running backs don't tend to win the award unless: 1) They're having some kind of historic season, ala Adrian Peterson in 2012; and 2) There's not a clear-cut quarterback candidate. As brilliant as Gurley's season has been, he's not breaking any records. And the quarterback in New England has done nothing to deserve not to win it. Gurley's case is strong, but for a running back to win MVP, circumstances have to be different than they are this year. The case for Wentz: Well, did you watch the Eagles' offense on Monday night without him? Even after missing the past two games because of a torn ACL that will keep him out until next season, Wentz still leads the league with 33 touchdown passes against only seven interceptions. He's fourth in passer rating and first in QBR, and before his injury, he was leading the Eagles to the best record in the NFC and No. 1 seeding. Wentz's 13-game body of work in 2017 is worthy of strong consideration for the award, and it became painfully clear watching his team against the Raiders on Monday that the Eagles are missing a lot without his ability to pull third-down conversions out of a hat. The case against Wentz: He'll end up having played only 81 percent of the season, which necessarily hurts his case against similarly qualified candidates who played 100 percent of it. That's the core of the case against him, though even when he was healthy, many of his supporting stats ranked behind Brady anyway. Three weeks ago, it was a close race between Brady and Wentz. The fact that one of them will finish the season and the other won't is why it's not close anymore. The case for Brees: He's the only one ahead of Brady in yards per pass attempt. He's fourth in the league in passing yards, second in passer rating and first in completion percentage with a figure of 71.9 that would break the single-season record of 71.6 that Sam Bradford set last year. (Bradford broke a record held by Brees, by the way -- 71.2 percent in 2011.) Brees also ranks (a distant) second to Brady in Football Outsiders' DYAR metric we cited earlier, and he's doing all of this with a bit of a downgraded receiving corps that lost Brandin Cooks in the offseason and really didn't do much to replace him. The case against Brees: There's a strong argument to be made that Brees isn't doing anything much different than he did any of the past three years, when the Saints finished 7-9, and that the reason for the team's improvement is the defense and the run game. You could make arguments for running backs Alvin Kamara and Mark Ingram as the Saints' MVPs this year. Brees also has only 22 touchdown passes, a low number for him, and more important, for MVP candidates. He's only 11th in QBR. The case for Keenum: It's tight down here. Keenum and Brees tied with 12 points each, one ahead of Steelers running back Le'Veon Bell and two ahead of Wilson. So this is where the poll could look different next week. In the meantime, here's Keenum -- an offseason afterthought who became the starting quarterback on one of the best teams in the league. He's second to Wentz in Total QBR and fourth in completion percentage. The case against Keenum: Other than QBR, the numbers don't really stack up with the other top candidates. Keenum is a great story, but it's hard to imagine that he could have done this with a lesser roster. The Vikings' receivers are among the league's best, the running back corps has depth, the defense is a monster and the offensive line has protected him well. He has done nothing wrong, and is to be commended for his performance. But the guys ahead of him on this list just seem a little more integral to their teams' successes than Keenum does to the Vikings.